Inside Bridgeton Bus Garage glimpsed from a departing bus. 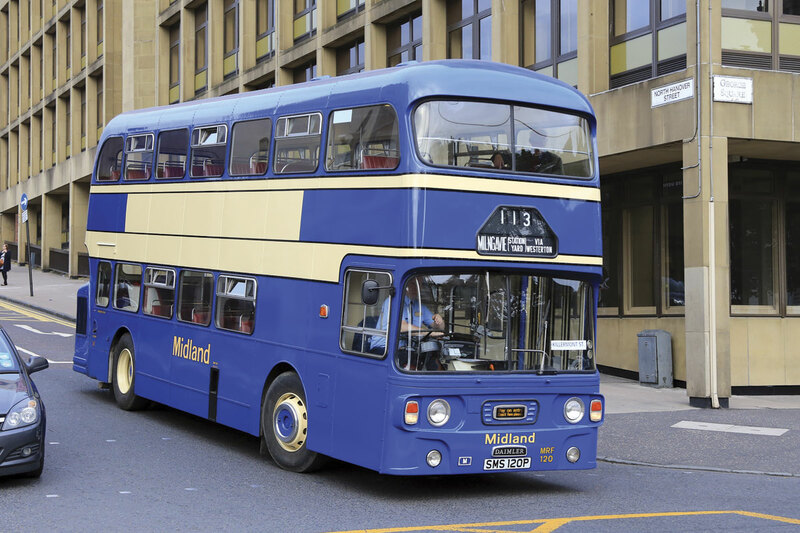 A 1976 Daimler Fleetline restored in Alexander Midland colours turns into Glasgow’s George Square. An interesting visitor to this year’s October event at Bridgeton was this former demonstrator Leyland National from Workington. 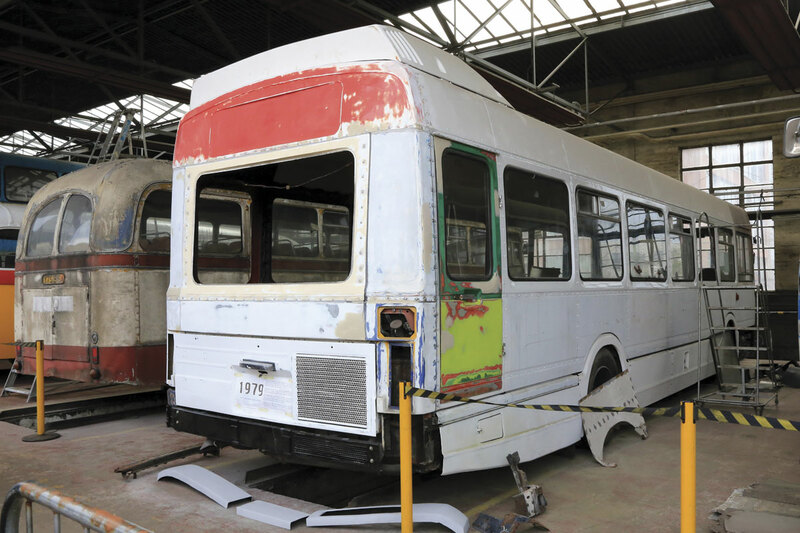 Restoration in progress on GVVT’s Leyland National. 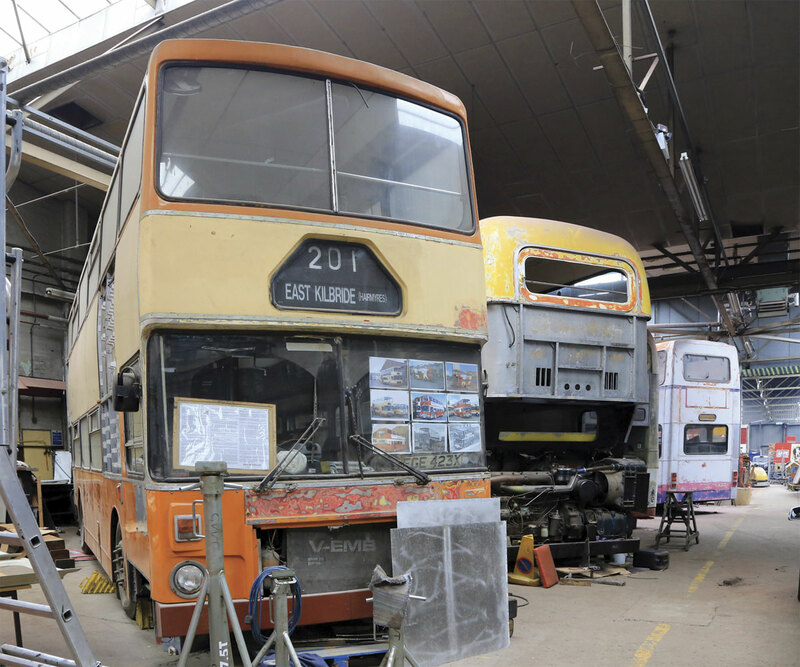 The closed off main workshop area with a variety of Alexander bodied vehicles under restoration. 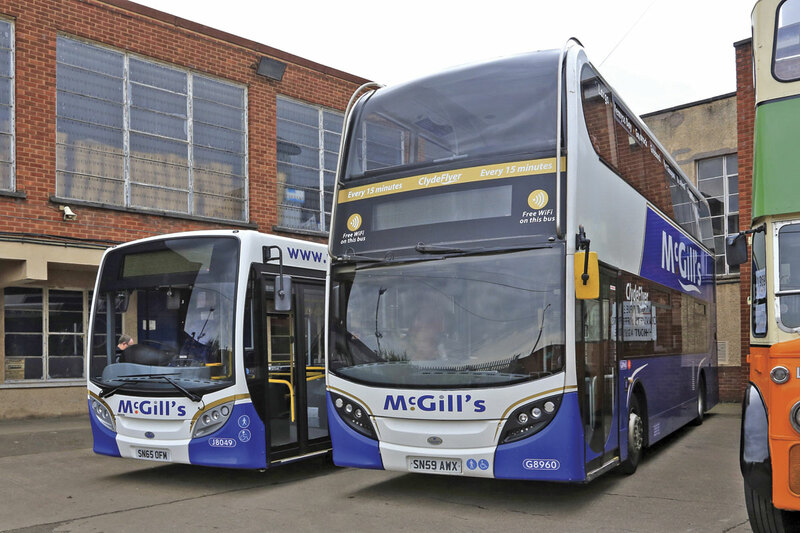 McGills supported the October event with a newly delivered ADL Enviro 200 and a very smart six year old Enviro 400. 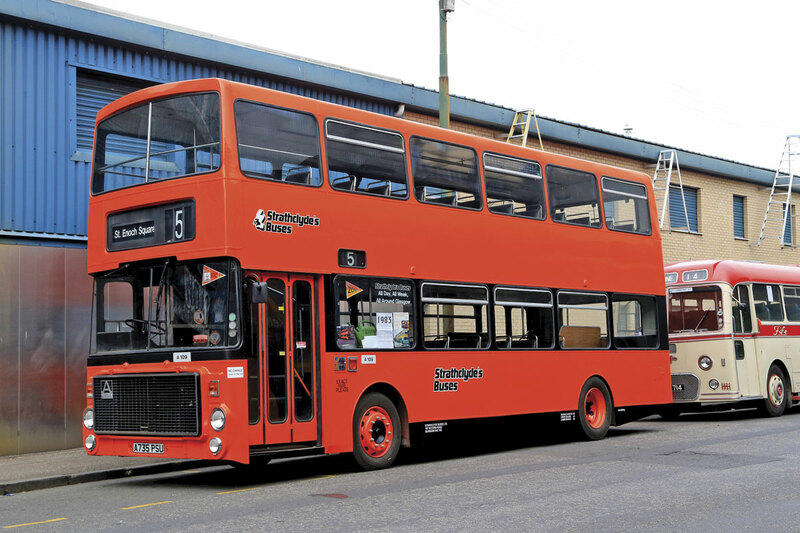 A 1983 Volvo Ailsa restored in Strathclyde’s vivid orange and black livery. 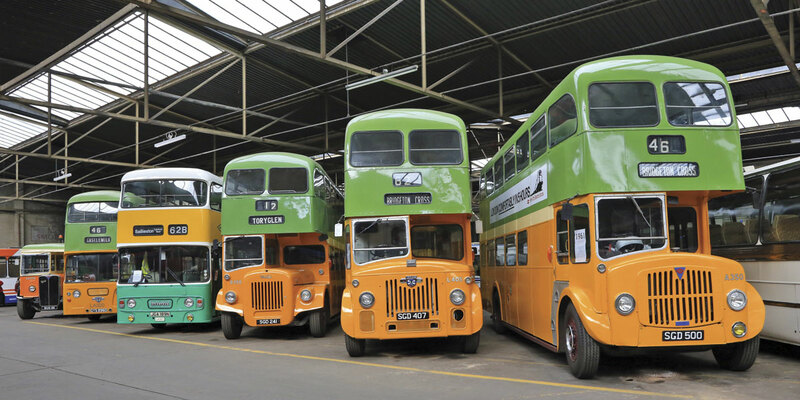 A smart line up of restored Glasgow Corporation vehicles. A scene from the 1970s recreated in Glasgow’s George Square. 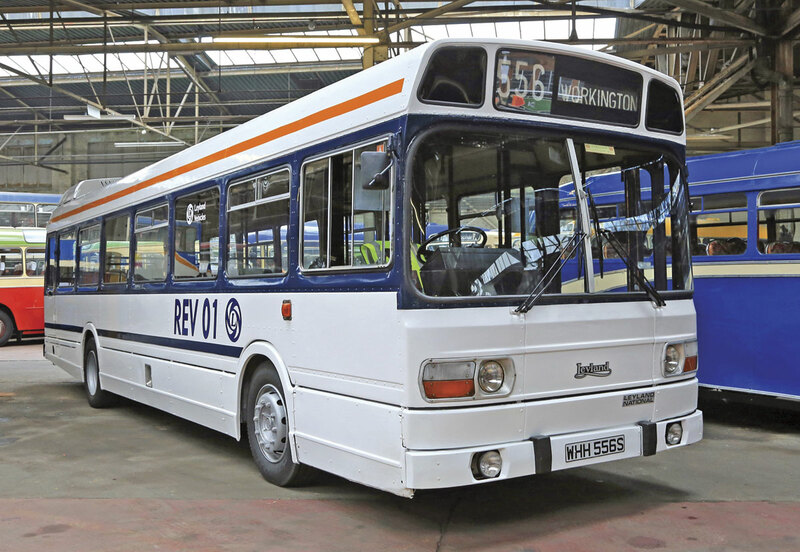 Since Bus and Coach Buyer visited Bridgeton Bus Garage in 2014, the Glasgow Vintage Vehicle Trust has significantly increased the opportunities for the public to see the work of the trust and the vehicles that call the garage home. In 2015, there has been a special event to celebrate the garage’s golden jubilee followed by monthly Sunday openings during the summer and culminating in an expansion of the annual October open day to a weekend event. 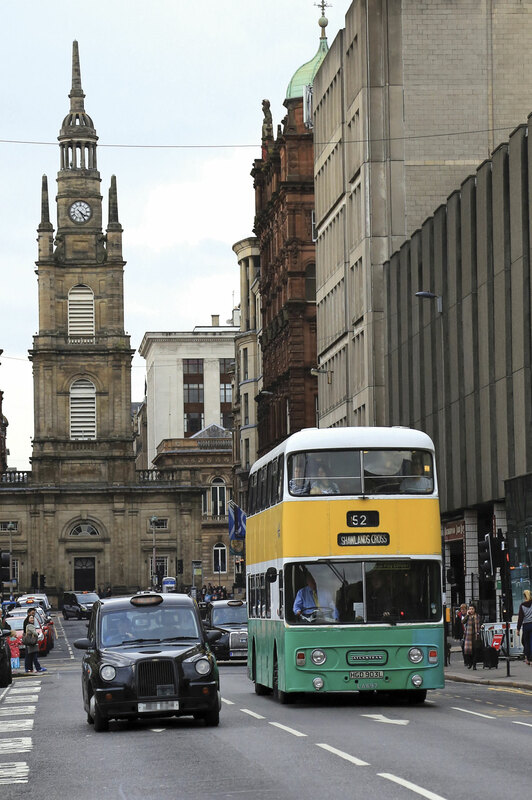 Trust with their demonstrator Leyland National REV01 and Kevin Carroll with his Glasgow Atlantean from Bristol. Breaking away from their busy Sunday afternoon schedule, Trustees Gary McGowan (Chairman) and Gary Conn talked to Bus and Coach Buyer about GVVT’s key partnership supporting the local community and explained the activities underway in the workshop area which is not normally open to visitors. The ‘Back On the Road’ project aims to support those with addictions on a return path to social inclusion. In addition to instruction in the use of tools and basic bodybuilding skills, the training led by GVVT’s Gordon Kerr supports the trainees’ development of positive personal habits and the introduction of structure to their lives. The latter includes activities such as accepting the need to attend work at a defined time every day. Since its introduction, the programme has taken a number of forms depending on funding availability. When fully externally funded, trainees attended full time for six months and were paid a wage with GVVT received a payment for its involvement. Following funding changes, the determination of the Trust to continue the programme has seen the costs of funding the trainer being met by themselves and the trainees attending only one or two days a week, a maximum of 16 hours per week not impacting on their benefits. Up to a dozen trainees are now involved during the working week. The Trust is always keen to hear from organisations who would be interested in supporting the work. In addition to the positive impact that the programme represents for the individual and the community, some trainees have followed it with a return to work, not necessarily in a workshop context but using their new life skills and structure. The Trust is particularly pleased that a number of trainees from earlier programmes now volunteer their services in support of the ongoing activities at Bridgeton. The trainees are currently involved specifically with two long term restoration projects which were displayed in the depots open pit area; a Duple Bella Vista bodied Bedford VAS which originated with Abbeyways in Halifax but which is intended to recall the large fleet of these operated by David MacBraynes, a much loved former operator in Scotland and a Leyland National. The latter was one of the only small batch of Nationals acquired by Greater Glasgow PTE in 1979. It subsequent life has included time with Millport Motors and a final use as a tea bar supporting the BBC Scotland series River City. It was donated to GVVT by the TV company and is one of the few vehicles at Bridgeton in GVVT ownership. Good progress is being made of the structural restoration with most of the type’s usual corrosion areas attended to. Samples of before and after panelling were displayed alongside the vehicle to show the extent of work required. Most vehicles at Bridgeton are privately owned with the rental of spaces forming the bulk of the Trust’s income. In addition to supporting the training programme, the Trust has recently invested in rewiring the whole building and is currently installing a state of the art archiving system in the area that was once the depot’s boxing gym. The screened off workshop area provides a well lit space for working on all sizes of vehicles and has a stores area which includes a wide variety of grp panel mouldings for obsolete vehicles as well as the usual mechanical units and spares. Workshop equipment has been donated by operators who have vacated older premises and an unusual ex military mobile workshop with a full range of machine tools is also kept on site.